Peter Berg (Hancock) produces and directs Battleship, an epic action-adventure that unfolds across the seas, in the skies and over land as our planet fights for survival against a superior force. 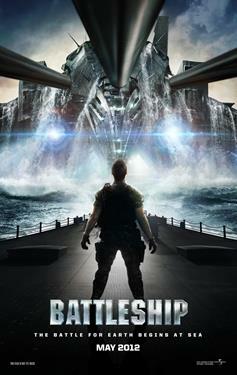 Based on Hasbro’s classic naval combat game, Battleship stars Taylor Kitsch as Lt. Alex Hopper, a Naval officer assigned to the USS John Paul Jones; Brooklyn Decker as Sam Shane, a physical therapist and Hopper’s fiancée; Alexander Skarsgård as Hopper’s older brother, Stone, Commanding Officer of the USS Sampson; Rihanna as Petty Officer Raikes, Hopper’s crewmate and a weapons specialist on the USS John Paul Jones; and international superstar Liam Neeson as Hopper and Stone’s superior (and Sam’s father), Admiral Shane. Berg directs this epic action-adventure also produced by Scott Stuber (Couples Retreat), Sarah Aubrey (The Kingdom), Brian Goldner and Bennett Schneir of Hasbro (the Transformers franchise), along with Duncan Henderson (Master and Commander).